Urban areas and other municipalities the world over are rightly con-sidered the engines of society, culture, and the economy. Towns and cities serve as hubs for commerce, public services, and amenities (universities and hospitals), and other human capital intensive ac-tivities. Without them, our human world would be nearly entropic. The requirement for these conurbations to exist depends primarily on one thing: money. That money arrives from taxes and fees. Determining the best form and level of tax is a tricky political and economic endeavor that – at times in history – has been raised to the level of blood sport. California’s Proposition 13 in the early 1980s resulted from a taxpayers’ ‘revolt’ that essen-tially froze the main source of municipal revenues: the property tax. The generally acknowledged outcome was a quick decline of local schools, services, and infrastructure. We’ve seen these ‘revolts’ elsewhere. How is it that the act of taxation can generate such heat? When cities are given local taxing powers, they usually resort to forms of tax such as the traditional property tax or other levies on work, investment, or commerce: wage, sales, or business taxes. Each of these options has its strengths and weaknesses. The greatest weak-ness common to all is that a policy goal other than raising money is secondary, if thought of at all (the cigarette tax meant to reduce smoking for example). If cities wish to create an environment of shared prosperity and stable revenue flow, mu-nicipal tax systems in an age of ever-increasing labor and capital mobility must themselves become modernized. A municipal wage tax matters little if wage earners move to avoid it. A municipal sales tax falls prey to the ‘border hopping’ effect. A municipal business tax be-comes a burden to commerce. A property tax, as Professor Vickrey tells us, can be prob-lematic, but it doesn’t have to be. What is LVT? LVT is an alternative version of the real property tax, used in 20 cities, school districts, and counties in the United States (mostly in Pennsylvania and Hawaii), as well as in most municipalities and states in Australia, Denmark, and New Zealand. LVT addresses the corrosive effect of the traditional property tax. In the US and Canada, prop-erty tax rates generally fall equally upon land values and building values. 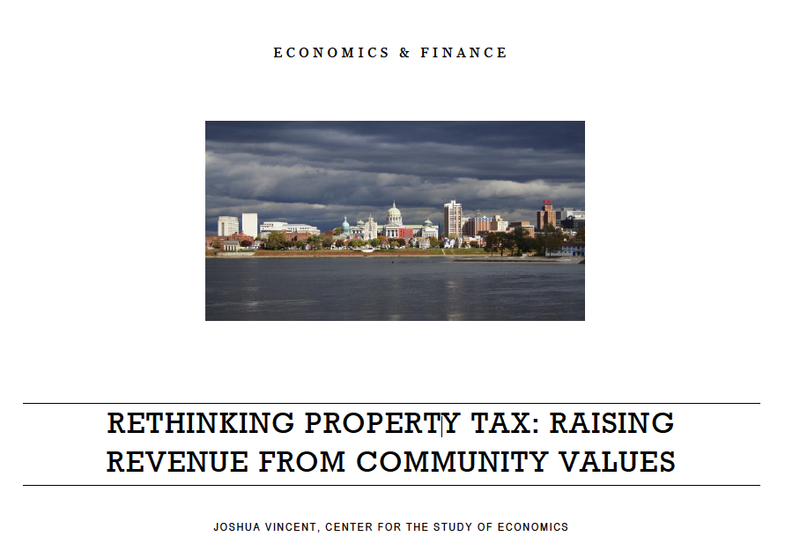 LVT shifts the greater share of property tax rate from buildings (both a product of private capital and pri-vate labor) to the assessed value of land (a public good created by public and community investment). The property tax then becomes a policy with a purpose. As most municipal officials know, citizens in business realize that the current property tax punishes good behavior (reversing the intent of the cigarette tax mentioned earlier). When one improves a structure, the tax bill goes up. The more investment and work one puts in-to a building, the greater the tax liability. The underlying message is “If you improve your property and your community, we will make you pay.” For example, the City of Allentown Pennsylvania has dual tax rates of 5.038% on land values and 1.072% on building values. The land mill rate is nearly 5 times greater than the building rate. Under a standard tax, Allentown would have a single rate of 1.752%, collecting the same revenue. Why does this matter? Without LVT, nearly 80% of Allentown’s property tax revenue would come from what it needs most: continual injections of capital into building con-struction and maintenance. To perform these tasks, jobs must be created, and eventually homeowners and tenants come into the city, as the city subsequently becomes more com-petitive in attracting private capital and people. Without LVT, 20% of Allentown’s property tax revenue would come from land values. The value created by government investment and the desire of the market to take advantage of that investment (roads, sewers, police protection, fire protection, and schools), would sit fallow or be pocketed by speculative rather than productive investors. As it stands, Allen-town now collects 50% of revenue from land. As a result, tax reduction for most home-owners and built to highest and best use commercial parcels has been significant. Taxing land value provides permanent incentives for growth and reinvestment that go be-yond temporary and targeted tax incentives. Most municipalities and their parent gov-ernment have put in place abatement and subsidy programs to assist in spurring new de-velopment. This of course begs the question: “Why are we abating new construction?” The depressing answer is of course to get out from under a bad tax system that makes invest-ment difficult, especially in at-risk communities. Taxing land value ensures that the value created by the community is recaptured by the community in the form of taxation. It is often said government creates nothing of value. Untrue. Government day in and day out creates land value through infrastructure, services, and other amenities. Land values if collected by a municipality create a self-looping reve-nue mechanism that can fund every day services and provide a financing base for future capital improvements. Nobelist Joseph Stiglitz noted this theoretically with his famous ‘Henry George Theorem.’ He argued that land values or ‘economic rents’ are more than sufficient to pay for the maintenance of a healthy municipality or indeed a healthy trans-portation project. The conscious taxation of land values began in earnest in the late 1800s and early 1900s during the ferment of the industrial era and the rise of the progressive movement. Communities as diverse as Pittsburgh, Vancouver, Copenhagen, and Canberra all enacted land value tax in one form or another. The Canadian West abandoned its LVT system fairly early on; the rates were low and could not prevent speculation in the burgeoning port and railroad towns. However, valuations of real estate in British Columbia carefully differentiate between land and building values. Good assessments can lead to LVT in all but name. A 2014 study of the Town of Smithers in British Columbia performed by the Center for the Study of Economics, confirmed that the values were sound, but also that imposition of LVT would have the desired effect of putting pressure on vacant or underused land around the highways and railroad stops. Pittsburgh introduced LVT in 1911. From 1913 to about 1945, it was the primary source of revenue for city purposes. After the war, the popularity of local taxes grew as the concept of the “three-legged school” for tax policy came into favor. Dilution of LVT caused by the ascendance of sales, wage, and business taxes lessened the notable effect. After the steel crash of the late 1970s, Pittsburgh again turned to LVT and expanded the ratio of land tax to building tax to about 8 to 1. That 1979 expansion resulted in one of the few reliable met-rics for judging successive LVT: taxable building permits. Studies by the Center, a team from the University of Maryland and others confirmed that while the rest of the rustbelt sank quickly from economic relevance, Pittsburgh not only stabilized but rebounded. Sadly, politics and property valuation mixed in 2001. A botched revaluation led to piece-meal land valuations; without consistency from one parcel to another the city suspended LVT. It is cold comfort, but Pittsburgh’s fiscal situation remains precarious, and most growth is now subsidized or not taxable (the growth of NGOs such as universities and hos-pitals). One of the most successful modern planned cities in the world was the new capital of Aus-tralia, Canberra. Designed by Walter Burley Griffin, it was agreed that the funding mecha-nism upon which the city was overlaid would be based upon site values only. Again, this experiment was diluted over the years. Happily the current Australian Capital Territory’s government has seen fit to return to an emphasis on site values for funding the city opera-tions as well as the expansion of light rail to its outlying neighborhoods. Outside of Pittsburgh, the progress of LVT has been fairly steady since legislative permis-sion was granted to other Pennsylvania cities in the 1950s. Currently, the City of Altoona, a formally prosperous railroad center, which economically and geographically is in relative isolation, enacted LVT in 2001. With the gradual and year shift away from building taxes, Altoona became the first city in the United States to abandon its tax on buildings altogeth-er. This shift has been blunted somewhat by the fact that the school district (a separate taxing entity) cannot currently enact LVT. Yet, the number of vacant lots has dropped, property tax revenue has been stabilized, and the vast majority of retired or working homeowners have seen substantial tax decreases. 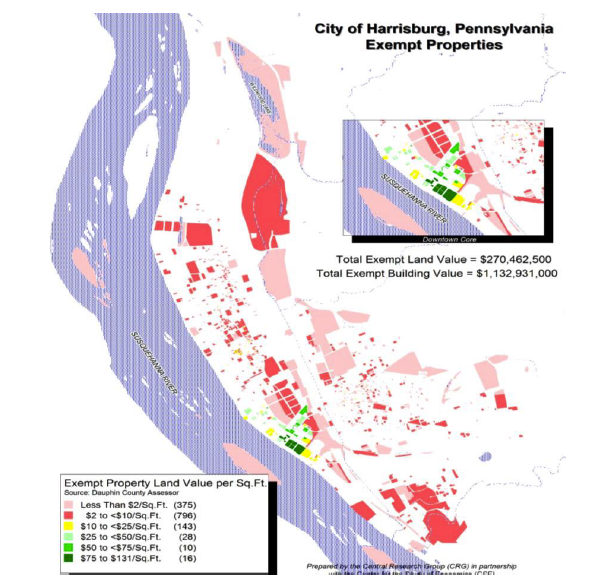 The City of Harrisburg enacted LVT in 1975, as a policy tool to discourage land speculation and to help the city recover from the ravages of a disastrous flood resulting from Hurri-cane Agnes. In that time, the ‘rate spread’ of land tax to building tax has expanded to a ra-tio of 6 to 1. Former and current municipal leaders credit LVT with creating an environ-ment for investment and reinvestment in very old housing and commercial stock. Building permit issuance increased during each expansion of the land rate. Burdened with nonrelated bond obligations that have the city flirting with bankruptcy, Harrisburg has maintained its LVT for several good reasons: the downtown has been re-built and homeowners pay modest property taxes all in the face of Harrisburg’s position as the seat of Pennsylvania State government. So much land is tax-exempt, the LVT policy serves to compel or incentivize use of what land is left for private use. Currently, LVT efforts are moving out of Pennsylvania and into other stressed communi-ties in the US. In the City of Hartford Connecticut, which is one of the poorest cities in the United States and suffering under the burden of the highest tax rate in the state, the only development that takes place is heavily subsidized or is not taxable. Like Harrisburg, Hart-ford is the state capital with a tremendous amount of land that does not contribute to mu-nicipal coffers. The downtown in particular suffers from 50 years of depopulation and dis-investment. Using a particularly valuable vacant parcel (which until 1999 was the site of a large luxury hotel), creates a basic illustration of how LVT works in revenue terms and how it works conceptually. The lot itself is currently assessed at US $2.5 million. full LVT (after a gradual phase-in) and the builder went ahead with the project, the annual property tax bill would still be $1.01 million annually. The tax difference between the non-LVT and LVT system is clear and fiscally significant. LVT appears to provide an environ-ment for free markets to return to the city. Although the theory of LVT is generally regarded as unimpeachable by economists, in the real world changing tax systems is often ‘a long march.’ Various states in the US such as Maryland, New York, Pennsylvania and some others do permit LVT. Yet the influence of those who own valuable downtown underused land cannot be discounted. 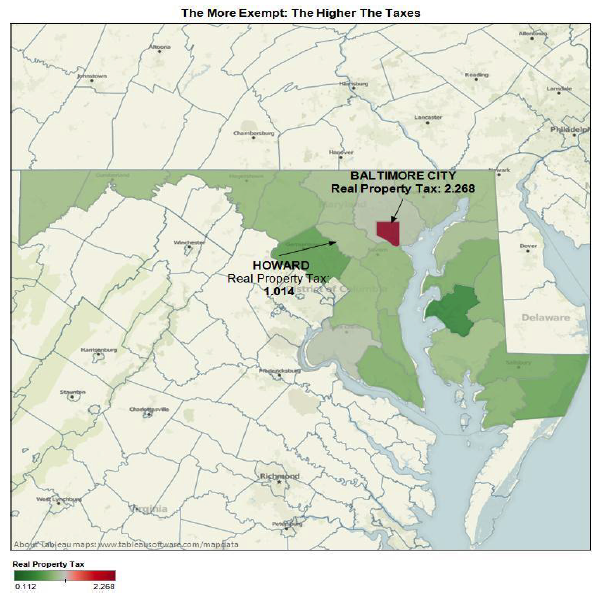 Municipalities understand that tax competition is crucial to their success (see map comparing the City of Baltimore property tax rate to surrounding jurisdictions to see why). But municipalities of all sizes are at a Rubicon. National and subnational aid is withering. Urban areas need to find tax systems that are fit for purpose, reliable, and do not distort crucial economic deci-sions by all sectors of the community. The attention paid to LVT is the result of decades of bad decisions, faddish economic development theories, and above all, inertia. Any town that wants to grow or maintain itself ought to look at that one revenue source under their feet that will never go away: land value. JOSHUA VINCENT is CEO of the Center for the Study of Economics, designing innovative systems of land value taxation (LVT) for Smart Growth and Urban Redevelopment strategies. Recognized for leadership in LVT study, Joshua wrote 50 LVT impact studies in the past 10 years. He was instru-mental in helping Allentown, PA create Home Rule that introduced LVT, working with local leaders and voters in 1996; in 2006 he implemented LVT for Clairton, PA, leading to tax reduction for built parcels and encouraged turnover of abandoned ones. In 2011, his LVT plan for Altoona eliminated taxing buildings, a first in the USA. Here’s a common urban finance scenario: Homeowners are upset about tax increases every year. The specter of those unable to pay provides ammunition for unflattering press, angry citizens and increased agitation from opponents. A natural reaction in the United States over the past 30 years has been to “do something”. This is the root of most property tax limitation movement from Prop 13 in California Prop 2 ½ in Massachusetts, New Jersey’s recent 2% annual tax increase in property taxes, and late but loudly to the game New York state’s 2% annual. A victory for the poor and middle class? Not quite. The economically impoverished town of Clairton Pennsylvania provides a simple explanation of how this works. Homeowners and business pay for how much water they use. Sounds almost fair enough. Leave the bathwater running all day long you pay more. But what’s really creating an issue and angst is another part of the water service: a flat fee. For residents, it’s $50 a month, whether you are a long retired steel worker who has little income or somebody making hundred thousand dollars a year. For business, you could be struggling storefront shop or a thriving pizza delivery and you pay hundred dollars a month. Regressivity is a more common outcome of user charges than is commonly recognized. That ought to change. The outcome the city services based on value can be made more progressive than resorting to invisible charges or flat fees. 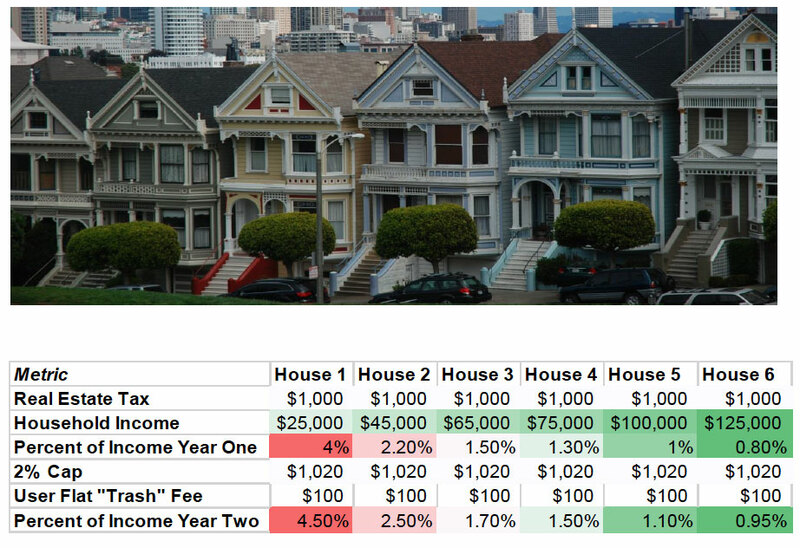 Six Houses in a row, all assessed at the same value of $100,000 at a tax rate of 1%. Taxes still rise, while local government seeks alternative funds in flat fees for services, such as trash pick up. Regressivity increases, collection costs increase, the goal of a tax cap to help those least able to pay? A failure. To the Honorable Members of the Joint Committee on Transportation: Good morning. My name is Joshua Vincent. The Center for the Study of Economics is a not-for-profit educational research foundation that explores alternative revenue sources for communities and government which do not hinder economic growth nor require the use of expensive subsidies and abatements. Since 1926, the Center has researched and helped implement the collection of what is called “economic rent” in the form of a land value tax. In its most basic form, land value tax is a revenue source that is generated by government and community investment that result in increased site values. Like most economists, we believe that taxpayer generated value ought to be recollected by government. It ought to be the primary source of government revenue to the greatest degree possible, in place of corrosive and destructive taxation of commerce, wages and investment. HB 6347 calls for a study commissioned by the Connecticut General Assembly to study the feasibility and outcomes of using the “land value capture method” of financing and maintaining transportation capital improvement projects and ongoing maintenance. This plan makes sense for the long often neglected corridors that connect municipalities throughout Connecticut. Nearly 50 years of post-industrial disinvestment coupled with local and state tax policy repellent to investment have taken their toll. A responsible transportation strategy would make it possible to revitalize each stop along a proposed route, and provide an environment for private market investment, as well as funding and maintaining these critical transportation corridors. No one denies that Connecticut’s transportation network does not meet the needs of a modern industrial region that has the benefits of relative density and proximity to interstate and intrastate markets. Yet funding streams have been unreliable and lacking for decades. Likewise, no one denies that investment in any transportation network has an immediate impact on proximate land parcels: investment increases the value of the land. Currently, it is taken as a given, if considered at all, that public investment meant to benefit the public will accrue to private parties. As an example, recently New Jersey Transit studied the effect of the 1996 extension of the Midtown Direct Service on the Morris & Essex Line Manhattan. Over a nine-year period, homes within a 2 mile radius of each stop appreciated in value, with homes within walking distance increasing in value by 7.5%1. Again, although all New Jersey (and New York) taxpayers paid for this improvement, the benefit accrued to a very small number of parties. The benefit accrued could be returned to the taxpayers, and lesson direct cost nonusers and non-beneficiaries (i.e. increased taxes or interest on bonds); this is the principle behind value capture. There is no longer any question investment in transportation provides an increase in property values around transit nodes.2 In point of fact, these increases are not in “property” per se, but rather in land values. It is for this critical distinction that we now turn. No matter how worthy, how does government pay for such a project in a time of deficit and cutbacks from the federal and state levels? HB 6347 would propose studying not only financing for the initial project, such as would not be covered by the federal government in grants, but would also propose to study maintenance of the rail line, or transit home once established. We suggest that value capture (in a manner deemed most beneficial by the study) become the primary funding source for the project. Noted economists such as Joseph Stiglitz3, have noted that land values or “economic rents” are more than sufficient to pay for the maintenance of a healthy municipality or indeed a healthy transportation project. Increased land values around a transportation node would be the result purely of government investment. It is an obsolete and destructive concept that property owners immediately adjacent to the areas of public benefit be allowed to collect privately that which is created publicly. Increased values are created by the community, therefore they should be collected by the community. The Center supports the full ranging review that would be commissioned by HB 6347 to determine if the concept is sound – and we believe that it is – and to further explore innovative and new sources of funding, rather than revenue from the general fund, expensive and irresponsible over bonding, or from a dedicated revenue source (i.e. sales tax) that is detached from source (revenue) to purpose. Connecticut needs help, but cannot easily provide revenue for these essential improvements and upgrades to the transportation network. This project can provide substantial, long-term market generated help. The decline of federal and state aid will not be reversed in the foreseeable future. Worthy projects must be self-funded and self-maintained. HB 6347 will commission a study joining many other US states and Canadian provinces to see how this can be accomplished in the current and future fiscal climate (bibliography attached). Joshua Vincent is the Executive Director/CEO of the Center for the Study of Economics. He is an advocate for an innovative system of land taxation that encourages urban development and discourages urban disinvestment. Although considered too bold and controversial for some, experience in Pennsylvania and Maryland has shown that the land value taxation system typically lowers property taxes on homeowners and vastly increases new construction and infill construction in urban areas. Vincent writes and lectures extensively on this topic. Joshua has worked as a consultant to more than 75 municipalities, countries, NGOs and national governments. In this role, he works with tax departments and elected officials in restructuring their taxation to a land-based system and conducted over 50 land value impact studies for cities across the United States since 2000. Henry George’s principles. Our society. Your life. Discover it all, free.